Being human means making mistakes, and bad things can happen to you. It s all part of life. What happens when you face these things determines whether your life falls into an endless abyss or you rise above the negative to live a fulfilled life. Even in those darkest hours, there is someone to help you through God. All you have to do is ask. Author Joseph Isaiah III knows all too well about the torment that can plague your mind in the still of the night, when you are left alone to deal with the darkness of your own choices. Falsely Accused: The Journey and Testimony of Joseph Isaiah III is his personal story. It s one you ve heard often on the news and read about in newspapers. He shares his brokenness and the hurt and pain his actions have caused others, including those he loved. Throughout the pages of this book, you ll see how God intervened in those sometimes devastating and shocking events and brought the author to deliverance. 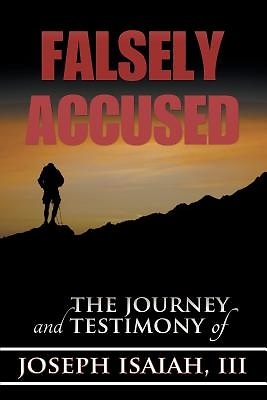 Falsely Accused: The Journey and Testimony of Joseph Isaiah III assures you God will deliver you, too, no matter what the challenges in your life may be. God alone has the power to take those difficulties and turn them around to bless you."